L.F. Jennings was honored with a NAIOP Northern Virginia award at the Association’s annual Focus on Excellence Gala on Thursday November 15th. L.F. Jennings received an Award of Excellence in the Building Capital Improvement (Non-Institutional) category for RTC West. RTC West is the re-imagined master plan for the campus previously known as Reston Executive Center. The development transforms the corporate park into a new and relevant destination in anticipation of the new adjacent metro station. This conversion to a walkable and pedestrian friendly environment is achieved by the addition of building amenities, hardscape upgrades, and 40,000 SF of retail. The new “pop out” retail is constructed into the existing office buildings, extending into the public space by 10 to 20 feet with new storefronts providing density and character diversity which give these developments a sense of place. The introduction of additional uses to the campus has helped attract new tenants, has extended the day-cycle occupancy of the site with evening and weekend visitors, and increased the economic activity of the area. Work on this project also included the partial removal of an existing parking garage to create a 2-way drive lane and major utilities were relocated to create a pad for future high-rise office building. Infrastructure work was also put in place to support future commercial and residential phases of the master plan. 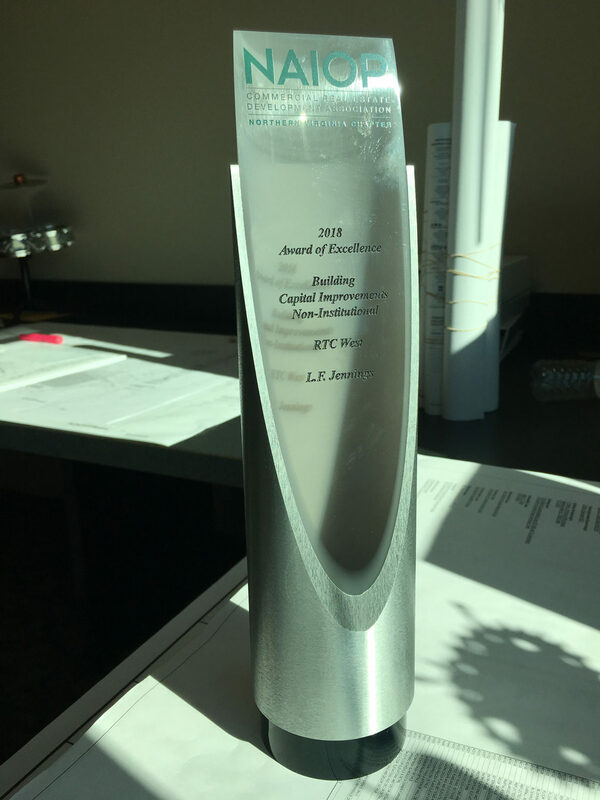 RTC was given an Award of Excellence for Building Capital Improvements (Non-Institutional). Congratulations to JBG Smith, Orr Partners, and Streetsense. L.F. Jennings would also like to thank all our subcontractor partners on helping us deliver an award-winning project for our Clients.